Property 1: The Fitzpatrick House. A detached house. Fully equipped and just like home! Property 9: Whole house with private patio and fenced yard near amenities and attractions. Property 13: 3BR POOL SIDE Luxury Cottage Sleeps 8 with Lake View! Property 20: 4BR Luxury Lakefront Cottage La Casa Resort Kelowna Sleeps up to 10! Property 25: Discovery Bay on the shore of Lake Okanagan. Discounted Spring Rates ! Upgraded Condo on 2 Golf Courses - Sleeps 6. Pool. Property 27: Discounted Spring Rates ! Upgraded Condo on 2 Golf Courses - Sleeps 6. Pool. Property 28: Recently updated Luxury four season resort. Check out the fall rates! Property 34: Beautiful Lakefront Retreat ! !Winter Early Spring Special!!! Property 38: Best Location In Town! One Block From Okanagan Lake And Downtown Kelowna! Property 39: Large 2 Bedroom Suite One Block From The Beach, City Park, and Downtown Kelowna! Property 40: One Bedroom Suite steps from the beach! Waterscapes Resort. This rental property is located in beautiful Kelowna, British Columbia, Canada and we look forward to your inquiry and/or reservation. Property 42: Waterscapes Resort. 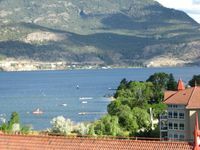 This rental property is located in beautiful Kelowna, British Columbia, Canada and we look forward to your inquiry and/or reservation.